“I was recording in the front room of my flat, getting up in the middle of the night to record vocal and guitar parts or sitting in front of the TV with my acoustic guitar and picking up on things that both excited and annoyed me: the circus of the celebrity rise and breakdown, love and loneliness, partying hard (sometimes too hard! 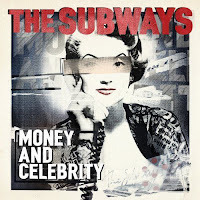 ), big money and the impact the financial crisis is having on us all ” This writing inspired much of the album with tracks like, soon to be teenage anthem, “We Don’t Need Money To Have A Good Time” written as a tonic to this crisis. And melodic album centrepiece ‘Popdeath’, a comment on the fast turn over of TV show generated celebrity.